Even before the dam was complete, Grand Coulee attracted visitors eager to view this unique geological landscape. Once construction started on the dam, sightseers came from all over the world to witness the creation of the "Eighth Wonder of the World" including two visits from President Roosevelt and one from President Truman. With the advent of the automobile, caravans of cars flocked to the Inland Empire, some driving over 700 miles out of their way to view what a few called the "white elephant in the desert". Promised to rival Niagara Falls, the Grand Coulee Dam attracted thousands of tourists a year while still under construction. In a matter of years, what was once a sparsely populated desert became a top tourist stop. As construction began in 1933, MWAK, the company contracted to build the dam, built the Vista House to accommodate the increasing number of onlookers. The favorite attraction is watching the water spill over dam in the spring. In the 1950s the dam was illuminated with colored lights for nighttime visitors. 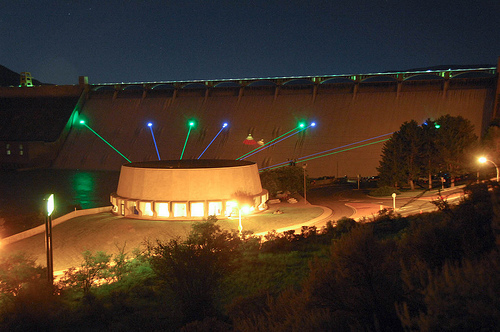 Today, in the spring and summer months, the gates are opened at night and visitors are treated to a laser light show while the water flows over the dam. The current Visitor's Center was part of the Third Powerhouse addition in the late 1970s. The design makes tourists feel like they are standing inside one of the generator rotators. Inside, there are exhibits on the dams origins, construction, and outputs, including videos about the dam itself and the geological forces that made this man-made wonder possible. 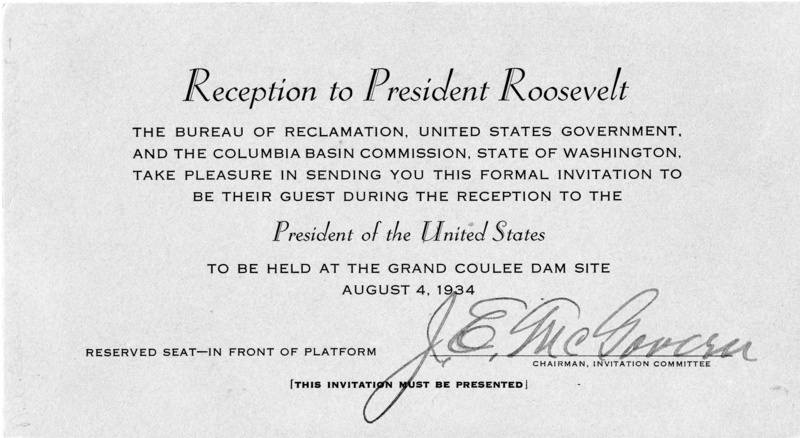 Invitation to the Reception for President Roosevelt. 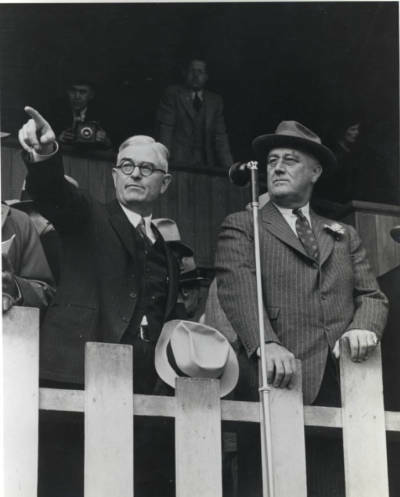 : One of the most famous visitors to the Grand Coulee Dam was President Roosevelt. This is an invitation to the reception welcoming him to dam site. Courtesy of The Northwest Room at the Spokane Public Library. 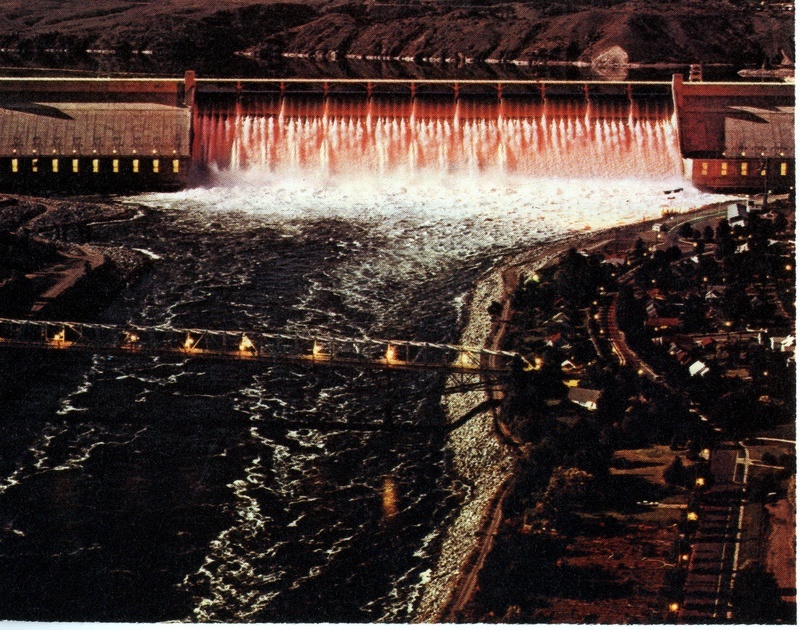 Grand Coulee Dam Light Show: In the 1950's the dam was lit up at night with colored lights as the water flowed through the gates and over the dam. Courtesy of The Grand Coulee Dam Area Chamber of Commerce. Earlier Tourists at the Grand Coulee Dam: As tourists flocked to see the construction of the dam, the contractors built viewing houses and parking lots to accomidate them. The Vista House, one on each side of the river, allowed tourists to learn about the dam and view the construction. Courtesy of The Northwest Room at the Spokane Public Library. President Roosevelt's Visit: President Roosevelt visited the dam while under construction twice. Here he is being shown around by Frank A. Banks, the Bureau of Reclamation construction superisor of the dam. Laser Light Show: After the construction of the new visitors center, the evening colored light show was replaced with a laser light show. 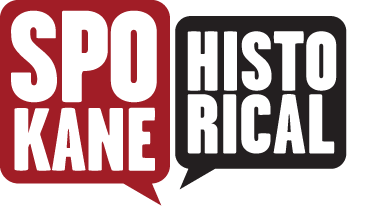 You can catch the show every evening from Memorial Day through September 30th. Courtesy of the Bureau of Reclamation. Erin Pulley, “Elephant in the Desert,” Spokane Historical, accessed April 20, 2019, https://spokanehistorical.org/items/show/374. “Dam's Big Show Unusual in Fall,” Spokesman Review, December 2, 1947. “Huge Tourist Horde Rolls over Nation's Highway Network Into Inland Empire,” Spokane Daily Chronicle, August 20, 1935. “Grand Coulee 'Falls' Promised to Rival Niagara,” Spokane Daily Chronicle, May 23, 1936. 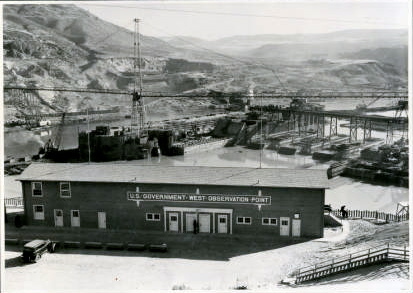 "Grand Coulee Dam Visitor's Center," Bureau of Reclamation, accessed October 25, 2013.